The App Association, a trade association representing the mobile app industry, has created a series of interactive maps illustrating the the high demand for software developers in the United States and the low number of high schools offering computer science education necessary to develop a workforce that can meet this demand. 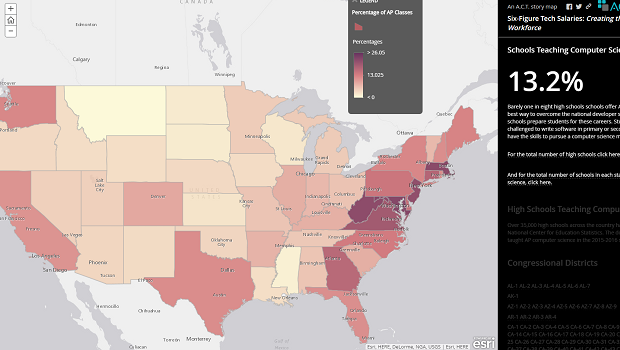 The maps show where in the country software developers work, how much those jobs pay, where job openings for software developers exist, and which high schools offer advanced placement (AP) computer science courses. Despite a high national average salary of $104,000 per year, there are approximately 223,000 unfilled software developer jobs across the country and only one in eight U.S. high schools teach AP computer science. The App Association built the maps with data from the Bureau of Labor Statistics, the National Center for Education Statistics, the U.S. Census Bureau, and the AP College Board.